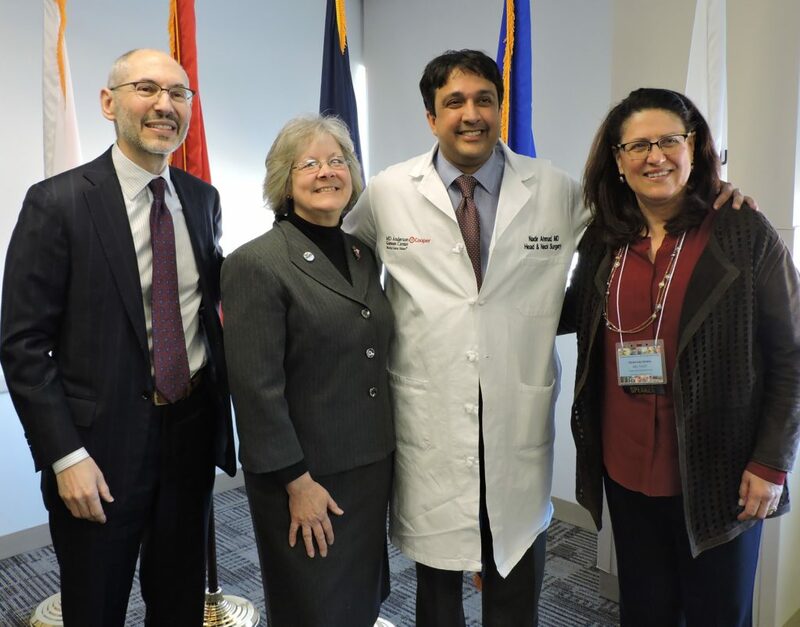 L-R: Dr. David P. Warshal, Department of Health’s Deputy Commissioner of Integrated Health Deborah Hartel, Dr. Nadir Ahmad, and Dr. Generosa Grana at the New Jersey Department of Health’s Human Papillomavirus (HPV) educational kick-off meeting for Partnering for a Health New Jersey. Cooper University Health Care was proud to host the New Jersey Department of Health’s Human Papillomavirus (HPV) educational kick-off meeting as part of its Partnering for a Health New Jersey initiative on January 31, 2019. A panel of experts, including physicians from MD Anderson Cancer Center at Cooper, discussed the epidemiology of HPV infections, current immunization coverage rates, and key steps toward prevention. Nearly 150 physicians, nurses, community health educators, health care administrators, and other stakeholders committed to reducing the incidence of, and mortality from HPV-associated cancers in New Jersey attended the event. The Department of Health’s Deputy Commissioner of Integrated Health Deborah Hartel joined Cooper’s Executive Chairman and CEO Adrienne Kirby to deliver opening remarks. The keynote address of the meeting was delivered by the Centers for Disease Control and Prevention’s Director of the Division of Cancer Prevention and Control Lisa C. Richardson, MD, MPH. MD Anderson At Cooper physicians David P. Warshal, MD, FACOG, Director of Gynecological Cancer Center, and Nadir Ahmad, MD, FACS, Director of the Head and Neck Cancer Program, and Generosa Grana, MD, FACP, Director of MD Anderson at Cooper, were among the speakers. HPV is a group of common viruses that can affect both males and females. HPV can be spread by skin-to-skin contact during any type of sexual activity with an infected person, even when no symptoms are present. According to the 2017 National Immunization Survey (NIS), 53.8 percent of females and 45.5 percent of males ages 13-17 years in New Jersey are considered up-to-date with HPV vaccination, which is similar to the national average of (49 percent) of adolescents. HPV vaccine is important because it protects against cancers caused by human papillomavirus (HPV) infection. HPV is a very common virus; nearly 80 million people are currently infected in the United States. Every year in the United States, 33,700 women and men are diagnosed with a cancer caused by HPV infection. HPV vaccination could prevent more than 90 percent of these cancers—about 31,000—from occurring. Between 2011-2015, about 1,900 new cases of HPV-associated cancer occurred each year among New Jersey residents. Compared to other states, New Jersey has one of the lowest incidence rates of HPV-associated cancers with an age-adjusted rate of 11.29 per 100,000 for all HPV-associated cancers combined. The most common HPV-associated cancer for women was cervical cancer. The most common HPV-associated cancer for men was oral and pharyngeal cancer. To learn more about HPV, click here.